Author: Moses, written 1450-1410 B.C. During the first inventory of fighting men at the base of Mt. Sinai as Moses and the rest were about to set out towards the Promised Land, the count of men 20 years old and up – from the twelve tribes – was 603,550. Not counting Levites (priests), women and children, the population of Israelites is estimated to have been around 2 million people at the time. The twelve tribes were to now camp under their banners as the Israelites traveled. Among them, the tribe of Judah – from which Jesus descended via Joseph, his “step-dad” – was to set up on the east side of the Tabernacle, towards the sunrise. Possible correlation to the sun and “Son?” Additionally, the tribe of Judah was to “lead the way” when the camps were on the move. The Levites were assigned by clan to determine what their jobs would be. They would camp with their clan nearer to the Tent of Meeting/Tabernacle, responsible for various items within the Tabernacle. Not all Levites were priests, but only a Levite could touch anything that had to do with the Tabernacle. Of the various jobs mentioned of the Levites’, who were responsible for protecting the Tabernacle, no guard or special forces jobs were spoken of. would have been cool for their to be a “secret service” type of group who watched over it. Maybe there was, but it was a secret? In the OT, God did not want lepers, people with skin diseases and pretty much any man or woman who was considered unclean living near Him or among His people. This is a stark contrast to when God walked the earth in the NT in the form of His Son Jesus Christ, who touched the diseased to heal them and ministered to everyone, especially the unclean. A Nazirite was someone who dedicated themselves to the service of God and made some sort of vow to Him that had to then be carried out. Some took the vow for only 30 days, some took it for a lifetime. They could not cut their hair, drink fermented beverages like wine or touch a dead body. They were set apart and groomed to be leaders. John the Baptist, Samson and Samuel were considered Nazirites. Levites served in the Tabernacle from age 25 until they were 50. At 50, they had to retire, but they were able to serve as guards of the Tabernacle. There’s the “secret” service. “Taberah” means “place of burning.” When the Israelites headed into the Wilderness of Paran towards the Promises Land, they began to complain about their hardship and “the Lord heard everything they said.” He sent a fire that torched people on the edges of the camp. The people then cried out and Moses asked God to stop. When the first generation of Israelites were condemned to wander the desert for 40 years, the events of last 37 of those is unknown. The Bible doesn’t mention them. It fast forwards to the newer generation where the end of Moses’ and Aaron’s leadership is at hand. The newer generation started to whine like the old one did. They had no food or water, and they complained about being in the desert. God then told Moses and Aaron to grab a staff from the Tabernacle and hold it over a rock, speak to the rock, and water would gush out, enough for everyone. However, Moses, perhaps fed up with the people, struck the rock twice. For this reason, God said Moses and Aaron that they would not be able to enter the Promised Land because “you did not trust me enough to demonstrate my holiness to the people of Israel.” Moses struck the rock instead of speaking to it, letting God have the glory. Eleazar, Aaron’s son, succeeded him as High Priest on Mount Hor, where God instructed Moses to take the priestly garments from Aaron and put them on Eleazar. There on the mountain, Aaron died. The people once again complained. God sent snakes to kill them as punishment. They cried out to God and he instructed Moses to build a fake snake and put in on a pole. All the people who looked at it were healed. This demonstrated people’s faith that God could heal, not so much that they thought snakes were magical. The snake on a pole is still a symbol of the medical profession today. The Bible references a book called “The Book of the Wars of the Lord.” (Numbers 21:14) Historians have found no other existing record of this book. It is assumed to be a book of songs or poems. Balaam, a sorcerer, yet follower of the Lord (? ), was recruited by King Malak to curse the Israelites who were coming to take the Promised Land. Balaam asked God for guidance, and God told him that the Israelites were blessed and to pretty much leave them alone. King Malak asked Balaam to curse the Israelites a second time, and this time God saw Balaam’s slipping willpower and craving for material wealth that he was promised, so God told him to go, but “only do what I tell you to do.” Balaam took his donkey and went with Malak’s men, but an angel stopped him at some point. His donkey was the first to see the angel who was holding a sword. The donkey ran off the road, but Balaam beat it and dragged it back onto the road. Next, the angel stood in a narrow section of the road, between two walls, and tried to squeeze passed the angel, scraping Balaam’s foot against the wall. 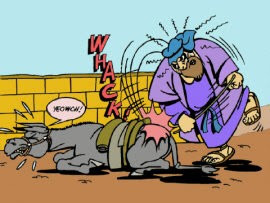 Balaam beat the donkey again. A third time the angel stood before Balaam on the road. The donkey simply laid down. And Balaam beat the donkey again. Then the donkey talked to him! It asked him why he was being so mean while he has served him all his life. Then the Angel of the Lord appeared to Balaam and he dropped to his face and asked for forgiveness. Balaam was a proven sorcerer, though not of God’s chosen people of Israel. He believe in God, but also in other gods. Why was he able to perform blessings and curses that worked? It is thought that God used him to show that God was all-powerful, over pagans and believers. King Balak wanted a curse on Israel, but Balaam, only able to speak the words God told him directly, blesses them instead. After the blessings, of which the Israelites may not yet have known, some of them started messing around with Moabite women and practicing crazy sexual and sacrifice escapades. God sent a plague that destroyed about 24,000 of the people involved. Also, right in the middle of the Israelites’ weeping and praying for forgiveness from God, and right in front of Moses and the priests, a dude named Zimri brought a pagan (Midianite) women named Cozbi into his tent to hook up. Phinehas, grandson of Aaron and son of the new High Priest, Eleazar, grabbed a spear and rushed the man’s tent. He put the spear through the dude and into the woman’s stomach. Their death ended the plague and God’s wrath. A second census of men over the age of 20 (fighting age) was conducted. 601,730 men. The Promised Land of Canaan was then divided up, with more land going to the bigger tribes and less to the smaller tribes. All to be broken up into lots, presumable for each clan inside each tribe. The Levites also had a new census for all males over the age of one month. 23,000 males. Except for Moses, Joshua and Caleb, all these people counted were different from the original men counted in the first census. The previous people had died in the wilderness as commanded by God for their sins and disbelief in His promises. All these daily, Sabbath and monthly offerings of lambs must’ve nearly wiped out the lamb population. It almost had to. That is a huge number of lambs to chop up everyday. Unless…one person, most likely Eleazar the High Priest, did this once for the entire nation – or one offering per tribe, or clan within a tribe. That seems more reasonable. Plus, sacrificing about 1 million lambs a day would take so much time it would spill over into the next day and all the schedules would be off. Sheep, goat, ram or bull. All were sacrificed up to the Lord for atonement of Sin and for thanksgiving pretty much on a daily basis in the OT. What’s the correlation to today, where we may be the sheep, the goats, the rams or the bulls? Are we sacrificing ourselves to the Lord, or are we up for sacrifice due to sin? It is evident that all the rules and sacrifice regulations in the OT – detailed down to the finest gram and ounce – were so intricate that no one could follow them perfectly 100% of the time. It was in vane, really, and used to show the people that no matter how hard they tried, perfection was unattainable – due to Adam and Eve’s fall way back when. In the world, sin will always win. We are born with it. The Bible says that Satan runs the earth. That is why we should all praise the real fact that Jesus, begotten Son of God and Who was God, came to earth to put away all these trivial sacrifices and rituals and die on the cross as a final sacrifice to beat sin and save us from the world and ourselves. Jewish people of today – who still do no recognize Jesus as the Messiah and One who put away the trivial sacrifices called for in the OT – still observe the Hebrew holidays, yet they don’t slice up lambs and goats on a regular basis. Aside from it being frowned upon these days, why is that they don’t adhere to continually having to atone for sin? Aaron was 123 years-old when he died on top of Mount Hor, giving his mantle of High Priest to Eleazar. No one could be found guilty from just one witness. There had to be at least two. And intent weighed heavily on the verdict.